**Disclosure: Our family was provided a gift card to help facilitate this post. All opinions are of my own, your opinion may vary. Since my family and I have been on a task to eat more healthy, we have tried and failed and many things! I must say, changing your eating habits after years and years can def be harder than it sounds. One thing that I have managed to cut out is dairy products. My husband and I are both lactose intolerant so it was a great transition for us. I have made the switch to Almond Milk. While there may be a small taste difference than regular milk, it's something that our family, even the kids have adopted well. There are many options for Almond Milk - do stay away from the ones that seem to have all that added sugar! While changing our eating habits, we've also changed our shopping habits and have started shopping at Whole Foods. I love that store, I could literally spend hours there lol! They just recently started to carry the first ever Organic Almond Milk. 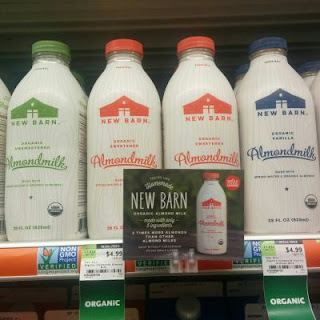 So what makes this Almond Milk so different? It's made with more almonds - which means more protein, healthy fats and an overall higher nutritious content. Ingredients include organic almonds, spring water from California, U.S. grown organic maple syrup in the sweetened version, organic acacia gum and sea salt. Exclusively available in the refrigerated dairy sections at the 56 Whole Foods Market stores in Southern California, Arizona, Southern Nevada and Hawaii. Click here for a yummy recipe using Almond Milk - Cherry Almond Smoothie! !